A Morganton businesswoman has expanded her food tours beyond downtown Morganton and is now offering tours in downtown Blowing Rock. Nancy Flango discovered her true passion in the food tours business when she opened Table Rock Food Tours in June of 2016 after working over 26 years as a professional insurance agent. Flango and husband, Bill, have always appreciated new dining experiences and the couple regularly sets aside date nights to explore restaurants not too far from home. They also frequent wineries and breweries in areas where they live and visit. Once on vacation in Charleston, the Flangos decided to take a food tour and enjoyed it so much they sought out tours in both Asheville, N.C. and Black Mountain, N.C. While on tour in Black Mountain in April of 2016, Flango, eager for a career change to something more in line with her passions, began to count in her head the places in downtown Morganton that would add up to make a nice tour and she discovered there was more than enough to entertain guests. “We took that tour in April and I hosted my first tour in June of 2016,” Nancy said. Armed with her experiences as a guest on food tours, Flango signed up for an online food tours course on Udemy almost immediately upon returning from Black Mountain so that she could learn how to structure the tours and also to find out if she could make money in the new business. Two weeks later, she approached businesses to bring on board with the tour. In addition to the food tour aspect, Flango, who holds a teaching degree, researched historical facts and events from Morganton at The Morganton Public Library and The Burke County History Museum so that she could pass along this knowledge to guests along the tour. From there, the food tours quickly took off and in February of 2017, Flango expanded her tours to Blowing Rock using the same concept and design she structured for the Morganton tours. Nancy has been fortunate in her venture in Blowing Rock and it has enhanced her all around business outlook. “The Blowing Rock Chamber of Commerce offered a fantastic seminar to all chamber members sponsored by the N.C. Retail Merchants Association where I gained knowledge of fantastic business tools such as Constant Contact and WordPress. There were so many different ideas on how to market a business so that experience was invaluable to me,” Flango said. Flango’s first Blowing Rock tour hosted ten guests which was ideal as her maximum number is 12 participants. Flango prefers to keep the numbers low so that the tour stays intimate and personal and there is plenty of room for interaction from everyone. The tour went off without a hitch and Flango will be offering it on a regular schedule and she is also available for custom tours by request for parties with enough participants. The registration process is made simple through her website Table Rock Food Tours where guests can specify things like their wine tastes and food requirements, such as allergies and intolerances. There is even a place to list nonalcoholic preferences so that establishments will have drinks on hand to meet those needs. Stops along the Blowing Rock tour include Blowing Rock Ale House, The Spice and Tea Exchange of Blowing Rock, Ugga Mugga Bakery, Savannah’s Oyster House, The Mellow Mushroom, Sunset and Vine, and The New Public House. These gracious hosts who greet each tour with information about their businesses and the food and beverages they serve, see the benefit of having a tour at their locations as well. The Spice and Tea Exchange of Blowing Rock is one stop where food and drinks are not served, but rather owner, Andy Barth, gives a tour of the shop sharing information about the specialty culinary items sold and how they can be used at home. “I was thrilled to have Nancy come and request to do the tour. I think it is a great thing for Blowing Rock and I am glad she has taken an interest in the area,” Barth said. For Flango, combining her lifelong passions of food and teaching through Table Rock Food Tours has turned into just the sort of thing she has been looking for in a career. “I love doing the tours. It really energizes me,” Flango said. 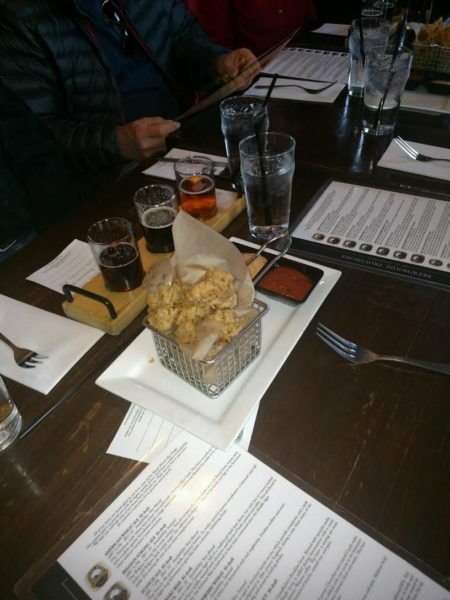 For more information on Table Rock Food Tours visit the website at www.tablerockfoodtours.com or the Facebook page https://www.facebook.com/Table-Rock-Food-Tours-1575478026115152/.